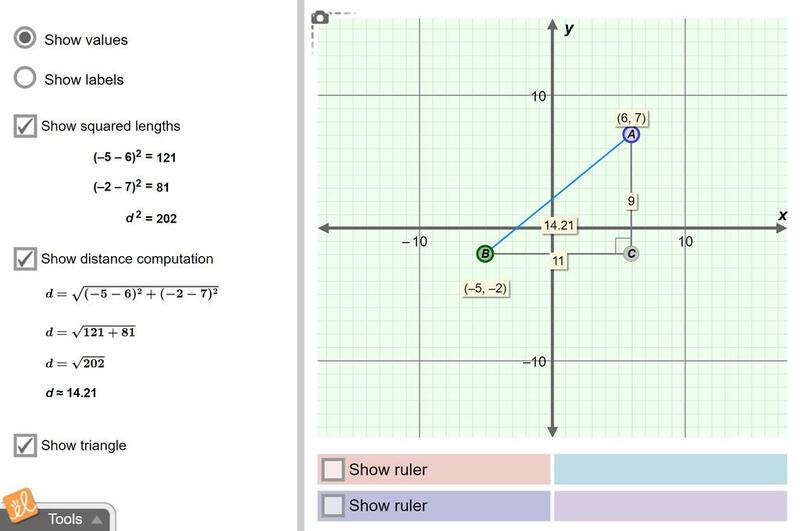 Explore the distance formula as an application of the Pythagorean theorem. Learn to see any two points as the endpoints of the hypotenuse of a right triangle. Drag those points and examine changes to the triangle and the distance calculation. USE THE DISTANCE FORMULA TO DISCOVER A SPECIAL RELATIONSHIP BETWEEN SIDE LENGTH AND HYPOTENUSE IN ISOSCEL... (more)ES RIGHT TRIANGLES . Students need to already know how to simplify radicals in order to be successful with this worksheet. State of Florida - MAFS Florida Standards Assessment - Gizmo Resource for Grade 8. Contains sample questi... (more)on stems, various response mechanism types, and Gizmo suggestions for teacher and student use. Great for visual learners. You must give a value for button A in Activity B. I used (5,5).